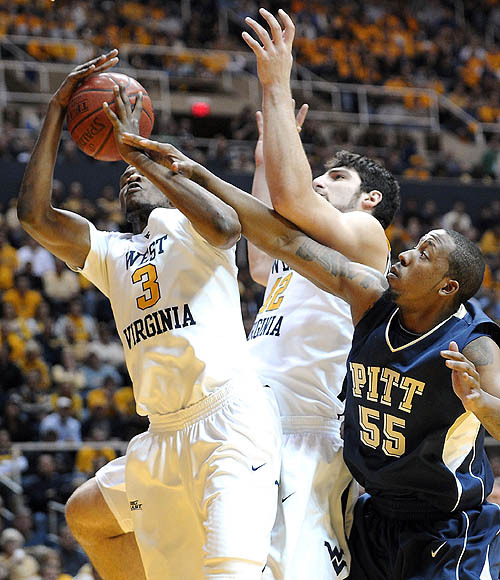 Backyard Brawl, Take Two: Revenge is the theme for the Pitt Panthers tonight at The Pete, when the West Virginia Mountaineers come to town for a rematch of the ugly contest a week ago that WVU won, 70-51. It's a big night not only for the Panthers, but for the crowd and the Oakland Zoo cheering section, which will be under the microscope after the harsh yet justified criticism of some unruly WVU fans last week. I'll be extremely disappointed in Pitt fans if they stoop to that level, but honestly, I don't see it happening. Pens, Rangers facing off at Igloo: It's going to be a big night for remote controls in the area, because there's also a Penguins home game on the slate tonight. The Penguins have won all four games against the Rangers this season, the most recent win coming on January 25 at MSG. The Pens will be without Eric Godard and Max Talbot, who are both dealing with groin injuries. The Penguins could move into first place in the Atlantic Division with a win and a New Jersey loss tonight. NFL prospects are finding their way to Pitt: With the upcoming inductions of Rickey Jackson and Russ Grimm into the Hall of Fame, the Pitt Panthers will have the seventh-most players in the hall, as they join Dan Marino, Tony Dorsett, Mike Ditka and Joe Schmidt. And that's a number that should increase in the future, with Curtis Martin, Ruben Brown, and Chris Doleman having good shots, as Larry Fitzgerald and Darrelle Revis should down the road. Former Pens carrying the flags: Three former Penguins will have the honors for their homelands, including Jaromir Jagr for the Czech Republic, Aleksey Morozov for Russia and Ziggy Palffy for Slovakia. Lets just hope for Slovakia's sake that Palffy doesn't retire in the middle of the ceremonies..
" Oh, and to the reader who compared John Elway to Bubby Brister, all I have to say is that you’re an idiot." After reading the article about Pitt Hall of Famers, I can't believe he was 187 and wanted to be an OLB. Even more the coach only made him get up to 200 lbs. He was 6'2 and playing almost the equivalent of a 3-4 OLB. Nowadays he would need to be closer to 230 to even have a shot at that. Its amazing how much athletes have changed in 25 years. A great day to be from Pittsburgh. Dejuan Blair went nuts tonight in the rookie challenge. 22 points 23 rebounds. who goes for 20 and 20 in an all*star game? As someone who absolutely hates Pitt....I must say congratulations. That was an epic win over a team (and even moreso a fanbase) who deserved to get put in their place. Hope you had fun tonight tocci. I know I did. I trying to think of what it would take for me to give a crap about a bad radio host interviewing "Jack Ham, Kurt Angle, and "Slapshot" star Dave Hanson".